Berry,Ulladulla, Huskisson, Mollymook, Milton and more. 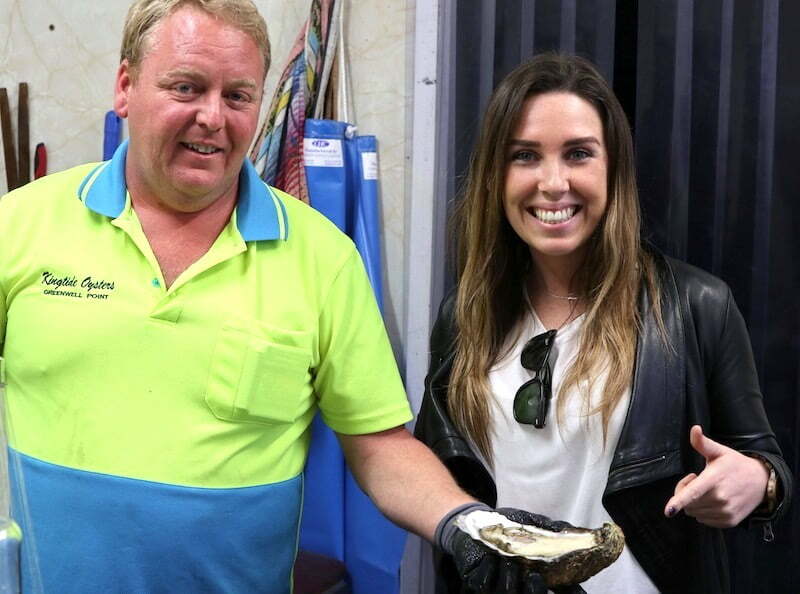 This is a must-read for any foodie planning a trip to Shoalhaven. Located just a short two-hour drive from Sydney and Canberra, Shoalhaven located on the NSW South Coast, is a foodie destination. From award-winning wineries to hatted restaurants, artisan producers, fresh seafood and plenty of local charm, this region is rich in food experiences. Top that with picturesque mountains, wide beaches and you’ve got one epic road trip. 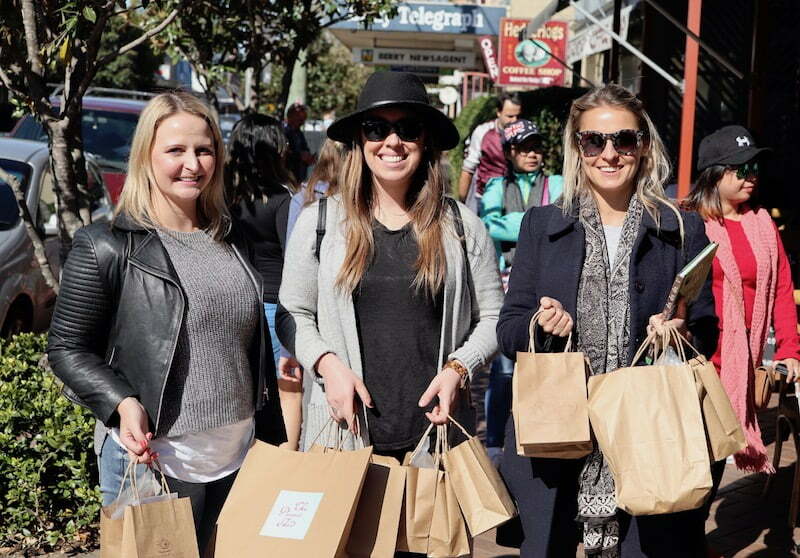 With the help of Shoalhaven Tourism we put the region to the test with a girls long weekend road trip. Planning your own getaway? Read on. St Isidore ranks high amongst the best regional NSW restaurants but this is no country bumpkin affair. The food is refined, contemporary and full of flavour. That’s partly due to their huge kitchen garden located next to the restaurant. They source most of their vegetables and herbs from the garden and utilise local producers where possible. 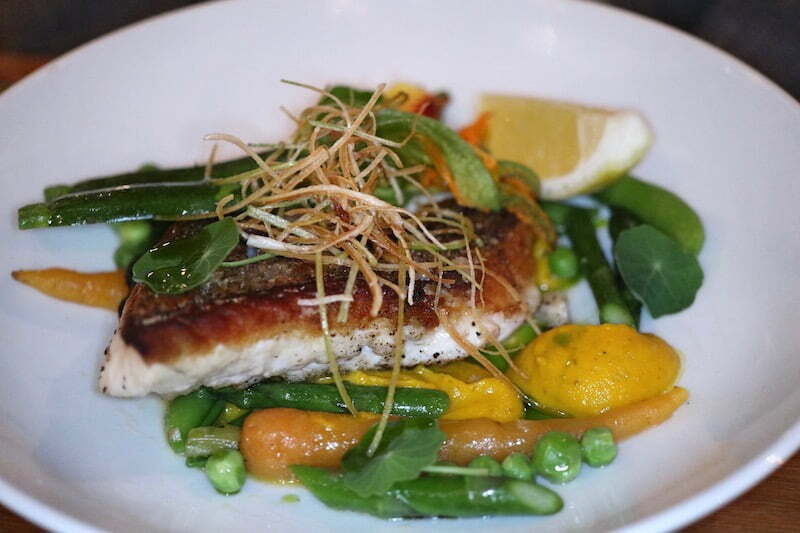 It shows in dishes such the Ulladulla snapper served with asparagus, spring peas, and zucchini flowers and spiced carrot puree or the Riverina short rib with celeriac, nashi pear, horseradish and yakiniku sauce. You’re bound to have a wonderful meal at this one hat restaurant any time of day but to fully appreciate the beautiful surrounds book in for lunch. St Isidore is open for lunch Fri -Sun and dinner Thurs – Sat. To make a booking phone 02 4455 7261 or email info@stisidore.com.au. We found the best cafe in Ulladulla! Native Cafe is run by two ex-Sydney locals who packed up their life in Bondi to move to Ulladulla. It was a smart move. Situated in the heart of town overlooking the beautiful Ulladulla harbour, Native Cafe is all about wholesome food and great coffee. 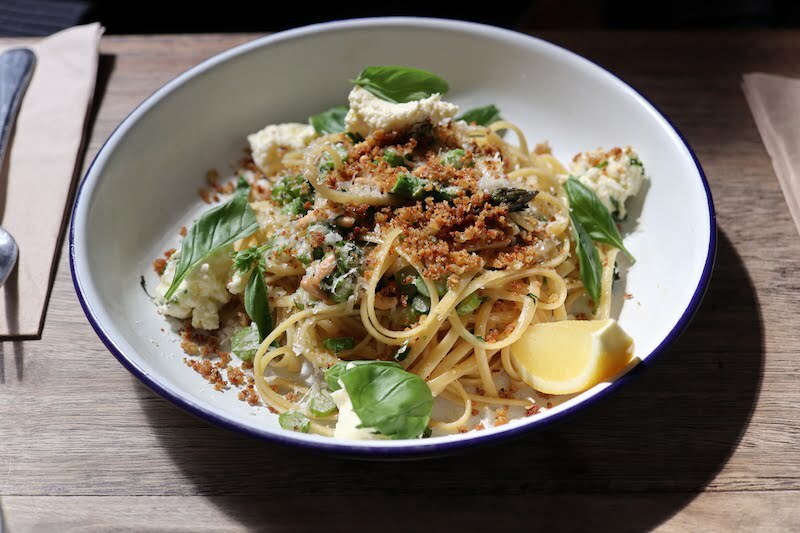 The menu reads similar to a trendy Bondi cafe including acai bowls, bircher muesli and smashed avo. 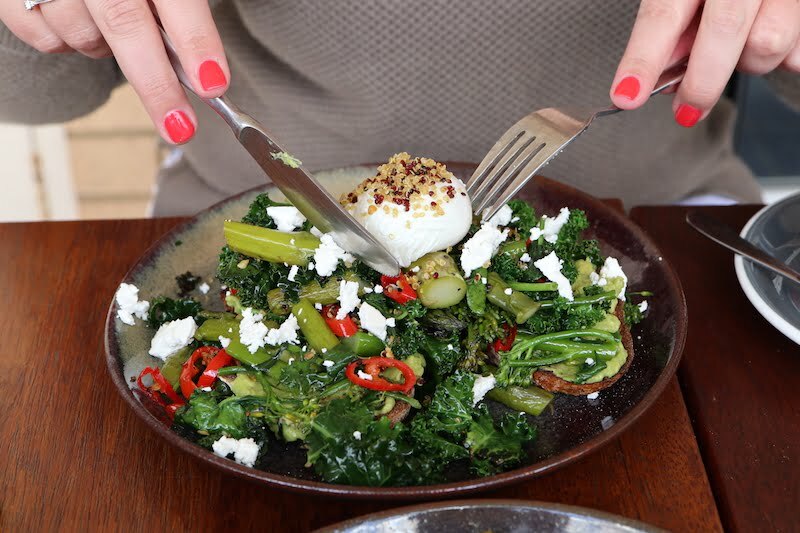 We loved the avocado on toast topped with sautéed greens, feta, chilli and a poached egg. Along with the great Will & Co. coffee Native Cafe also offer a variety of teas, smoothies, organic coconut water, kombucha and a fresh juices. The cafe is small with inside and alfresco seating. On the weekends it does get busy but it’s worth the wait. (Open daily from 6.30am, Phone: 02 4455 4789). Rick Stein at Bannisters is one of the most well-known restaurant on the South Coast courtesy of it’s celebrity chef owner. It’s one of those bucket list restaurants you want to tick off. This Shoalhaven dining experience is all about the seafood, from the coastal inspired decor to the menu. The dishes are fairly safe with not a great deal of innovation. But that might be the whole point. 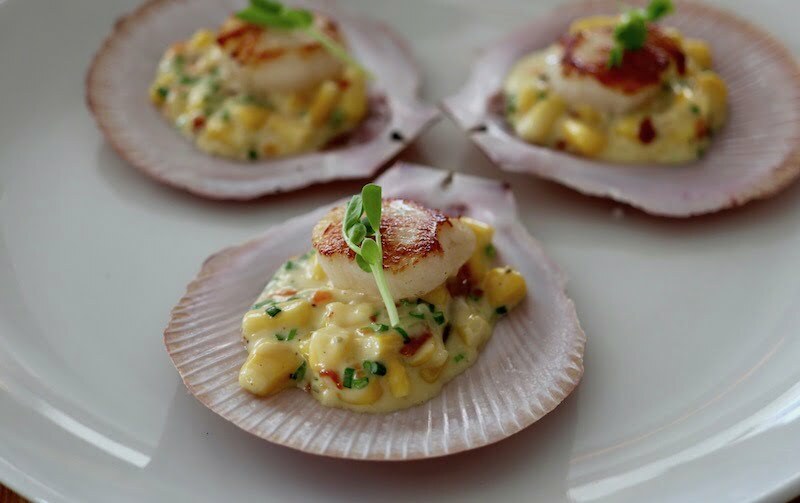 The ingredients take centre stage with hero dishes including plump seared Hervey Bay scallops with crispy ham, cream, sweet corn and chives. You can’t go to Bannisters and not try the fish pie. Salmon, barramundi, snapper, scallops, mushrooms and prawns are cooked in a creamy fish velouté sauce with black truffle and topped with breadcrumbs and parmesan. Other main dishes include king prawns, whole fish and crab curry. After lunch find a spot outside by the pool and order some espresso martinis. Before you know it dinner time will roll round and you can order pizzas from Bannisters Pool Bar. This was one of my favourite restaurants on the whole foodie road trip. Located in Mollymook, Tallwood offers a produce driven, contemporary dining experience centred around share dishes and great wine. 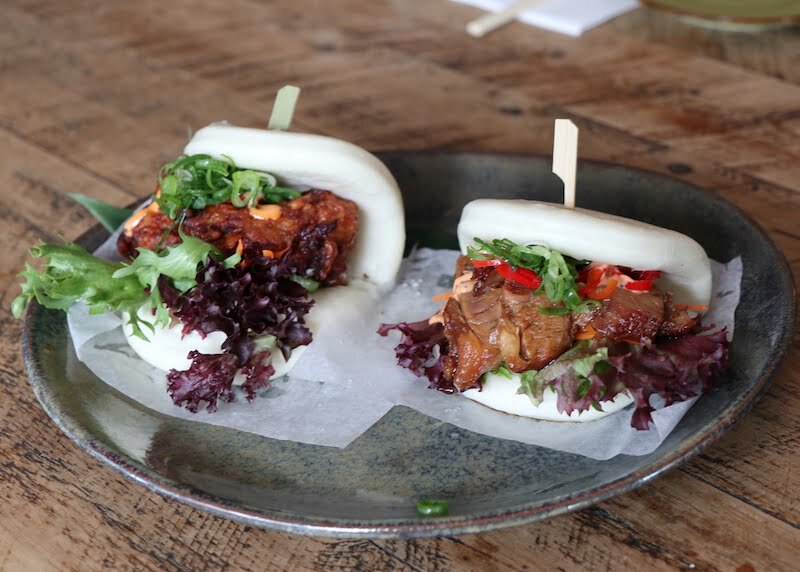 Drawing on inspiration from their extensive travels throughout Europe and Asia, owners Matt Upson & Clayton Till have designed a menu with influences from all over the world from South East Asia to Morocco. Vegetarian dishes such as the crisp cauliflower, saffron and currants compliment seafood dishes of Hervey Bay scallops, with chilli caramel, fragrant herb salad and shaved cuttlefish, garlic and chilli. 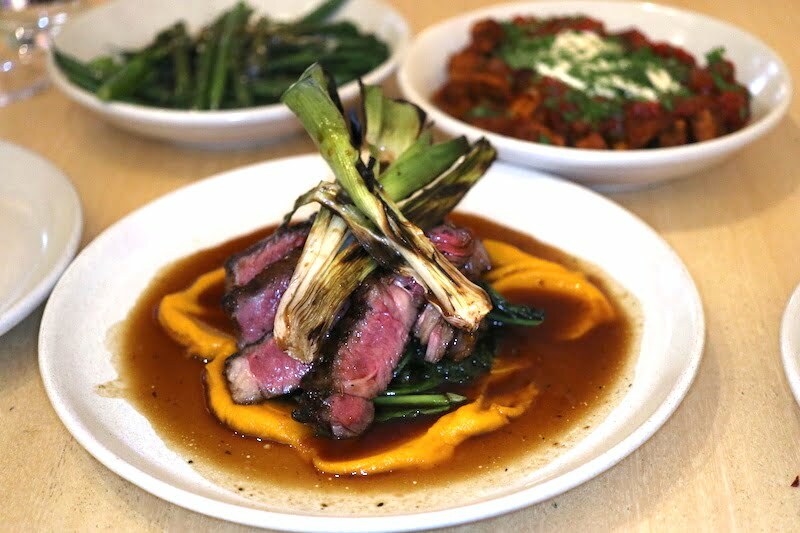 Proteins consist of organic scotch fillets and lamb rump served with fermented black barley, broad beans and romesco. One of the biggest draw cards of Tallwood is their friendly, knowledgable staff. 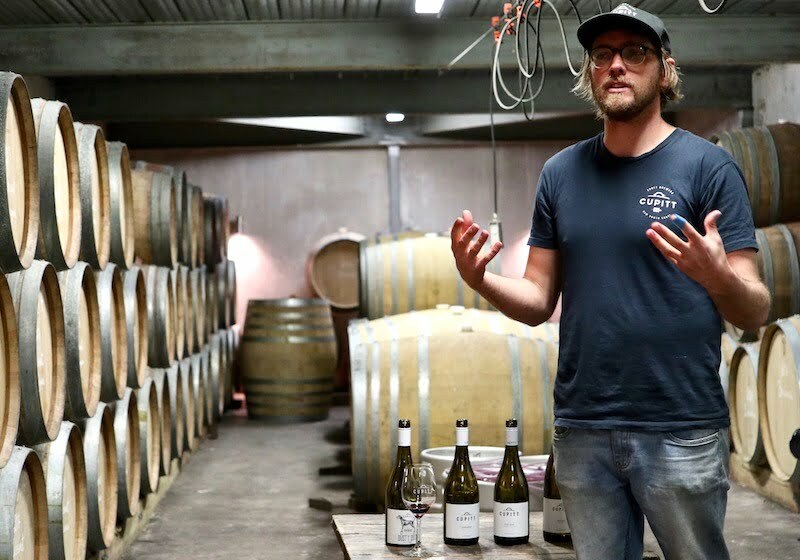 They know their wines and aren’t pretentious about it, rather excited to share their passion. Tallwood is open for dinner Wed – Mon and breakfast on the weekends. For a reservation phone 02 44555192. Berry is one of the most gourmet towns to visit in Shoalhaven, full of warm hospitality and delicious food. 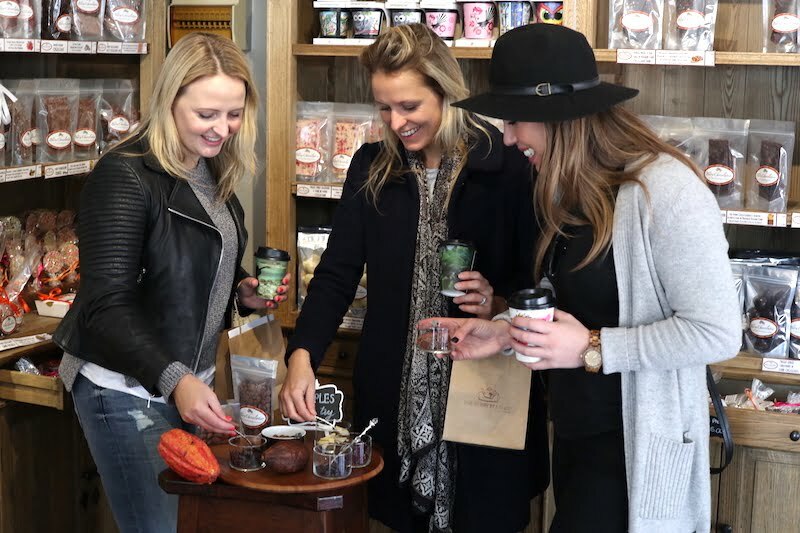 A great way to get a local’s perspective it to book yourself on to a Bite Around Berry Tour hosted by Foodscape Tours. You friendly local host will meet you at your first stop and take you to several shops, introducing you to the owners and arrange samples along the way. We started our tour at The Berry Tea Shop where owner Paulina took us through an informative tea tasting. Along with her husband Cliff (who bakes all of their delicious cakes) she’s created a must-visit shop for any teetotaller. Then it was on to the Berry Chocolatier for some hand-made chocolates and one of the best hot chocolates I’ve had in my life. A quick stop at Flavours of Shoalhaven saw us collect some organic eggs and herb salt. This shop stocks lots of wonderful products from local producers in the area and Spain. 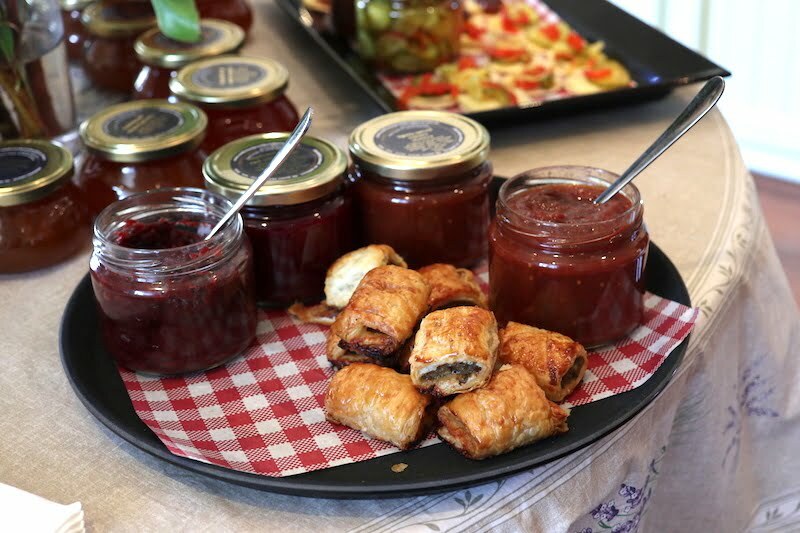 Next up we visited Julie and Geoff Webb at South Coast Providores for some incredible homemade sausage rolls topped with relish and other delectable condiments. I recommend buying some pickles, beetroot relish and marinated baby figs, none of which lasted long in my fridge upon return to Sydney. Our tour finished at Nourish Kitchen & Lifestyle owned by ex-Masterchef contestant Michelle Darlington. It’s a home-cook’s delight full of quirky kitchen appliances, cook books and interesting products from around the world. The Foodscape Tours experience can be booked any Fri, Sat or Sun for 6-20ppl. 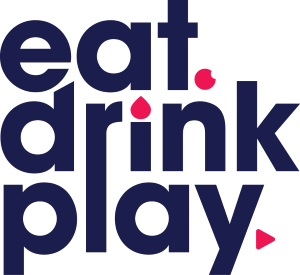 The walking tour costs $79 per head and includes food and beverage tastings, behind-the-scenes insights to the area’s food scene and your own local guide. To book call 1300 502 100 or email info@foodscapetours.com.au. While you’re in Shoalhaven you have to visit the Berry Sourdough Cafe. It’s set in a rustic old barn-style building with beautiful high ceilings, wooden floorboards and lots of natural light. One half of the space is an artisan bakery serving European-style pastries, cakes and savoury treats daily. Their sourdough breads are baked in two big woodfired ovens by an artisan baker. Our lunch here was memorable. Everything was simple but fresh. 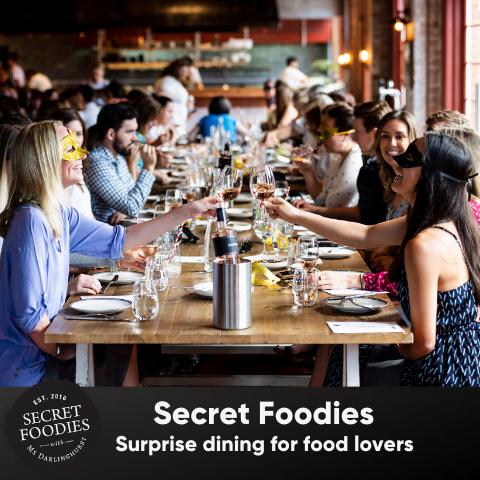 Think interesting salads like the sprouted quinoa with roast eggplant, cucumber, peanuts and beetroot juice dressing or a simple linguine amplified with asparagus, pine nuts, marinated ricotta, basil and pangrattato. Even a simple bruschetta was taken to the next level grilled mortadella, provolone and sweet pickled onions. Berry Sourdough are open for breakfast and lunch Wed – Sun and the menu changes regularly to include seasonal local produce. Cuppitt’s Winery is one of those unique triple threat kind of venues. A boutique winery, micro-brewery and fromagerie in one, there are a lot of reasons to visit. Tucked behind the hills of Milton on the NSW South Coast Cupitt’s regularly win awards for not only its wine, beer and cheese. This family run business also has a restaurant on site and is a popular wedding venue. The views are amazing and every Sunday they host live music and do a slow cooked BBQ. The Winery, Brewery and Fromagerie Tour is an awesome way to experience the Cupitt’s offering. Sample wine, beer and cheese during your guided tour of the property. To make a booking phone (02) 4455 7888 or emailinfo@cupitt.com.au. 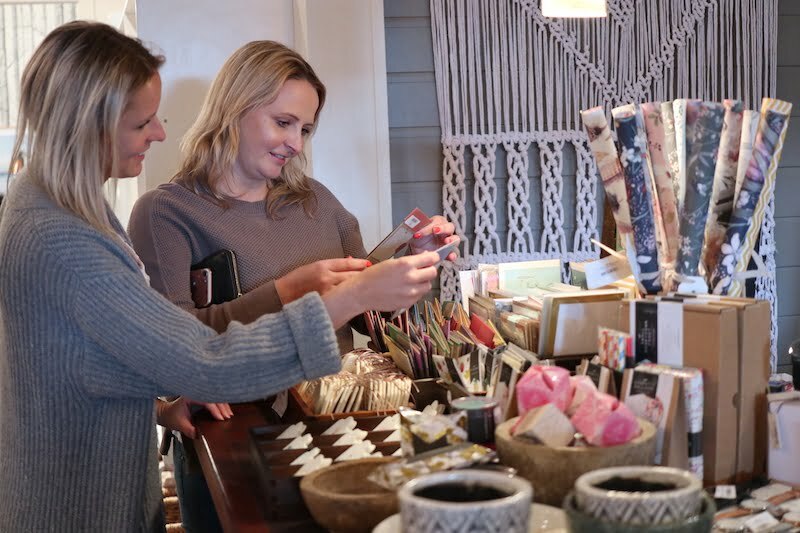 There are lots of really cute shops around Shoalhaven where you can find vintage secondhand goods, homewares and delicious homemade condiments. A few of my favourite spots include homewares store Few And Far. They have shops in Berry, Huskisson, Leura and Bowral. You’ll find anything from coastal inspire furniture, cushions and throws to jewellery and lush bath products. Behind the Berry Sourdough Cafe is The Picnic Shed, a small shop filled with local products and Australian designers. I picked up an awesome Will & Bear hat here. ‘The Green Buddah’ is a Balinese style studio located in the heart of the country. It’s a truly unique experience. With high thatched ceilings, wooden furnishings and a tranquil pool you could forget you’re in rural NSW. But take a look outside and you’ll see nothing but rolling green fields and a native landscape. Have a swim in the heated pool or do some mediation on the north facing deck. You also have full cooking facilities so it’s worth reserving some time to simply enjoy this property over breakfast or a BBQ. Mollymook and Narrawallee beaches are both within a 5-minute drive as are the Milton cafes and restaurants. The Green Buddah is perfect for two people as it is a studio style space but we slept three with one of us on the fold-out couch. Prices start from $650/week. 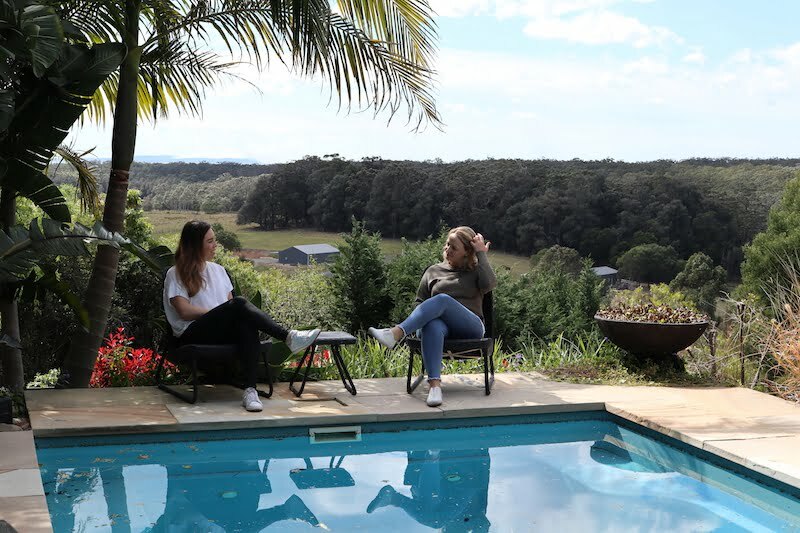 Milton Country Retreat is located on a 25 acre property just outside of Milton in Shoalhaven and is run by a lovely couple, Cassandra and Christopher Hamel. The three-bedroom home sleeps up to 6 people with 3 bedrooms and has a fully self-contained kitchen, BBQ area and fire place. What sets this place apart from other accomodation in the area is the complimentary chocolate platter. 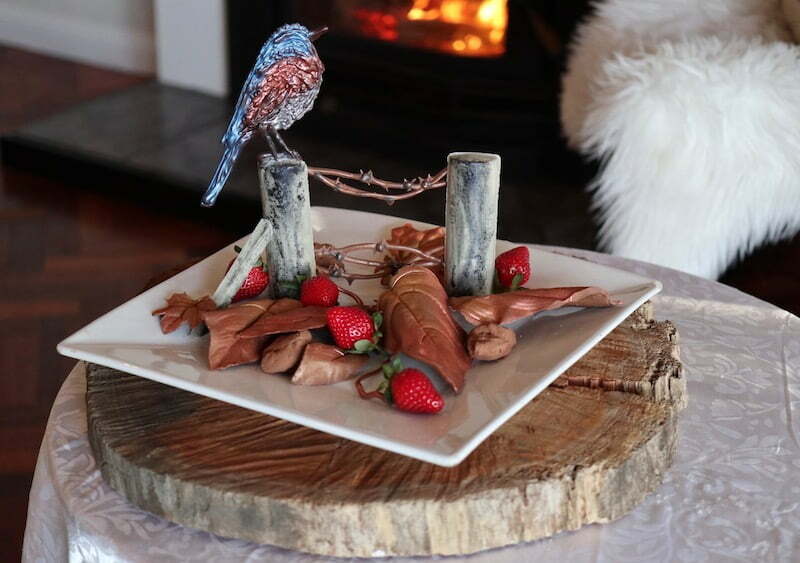 Your host Cassandra is a chocolatier and creates hand sculpted Belgium chocolate creations for her guests. We had a beautiful (and delicious) bird on our visit but visit her Instagram and you’ll see other designs. You can take in the view and enjoy your platter and some bubbles in the open field (see top featured image). While you’re there consider doing a chocolate workshop with Cassandra. They run for 4.5 hours and include a short tuition in tempering chocolate, a lavish picnic with cocktails and the chance to create your own chocolate sculpture. The cost is $150 per person or $120 per person for guests booked into the cottage. Accomodation varies from between $229-$399 per night for a maximum of 6 people. To find out more about Shoalhaven visit their website or Facebook. Special thanks to Shoalhaven Tourism for helping us arrange this itinerary.